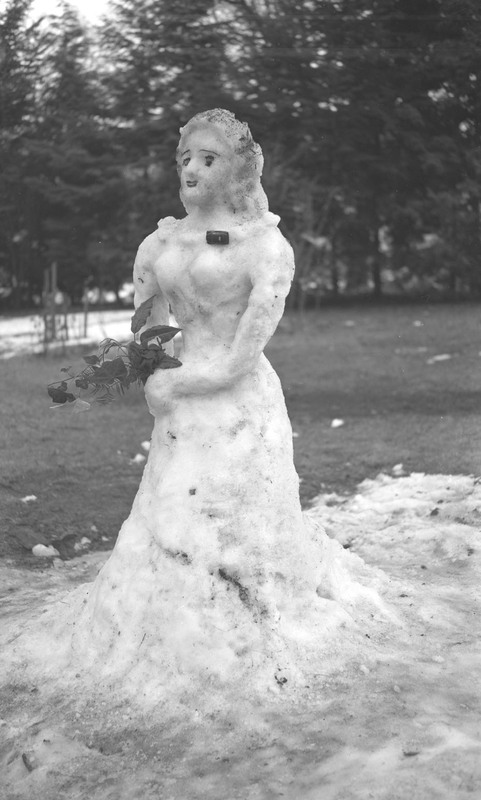 This particularly artful snow maiden was carved in 1948, and photographed by Alva Day. Brings back memories of Mrs. Kuhl (hope I have that right) who lived at 4th and May. She made snow angels on 4th between May and Prospect and used colored water to color them. They were really a work of art. Pretty, but go slow young man, she may not have a warm heart. Sorry, she lived on the corner of 4th and Prospect. Pretty sure thats in my yard on 4th and Prospect. We bought the house from Mildred Kuhl in 1992. I have some photos of other snow sculptures in the yard that I found during the renovation. Apparently, she was quite prolific. It would certainly make sense that Alva Day would document Mildred Kuhl's work as he lived just two blocks away. It's pretty amazing we can identify the creator of a 65 year old snow sculpture! Mildred Kuhl's snow angels were much more beautiful than this one. Back in the 1940-50's, Mildred Kuhl also made many of the posters advertising the plays put on by the Hood River Civic Theater. Looks like it took almost all the snow from the yard. I believe my Gramma, Lanora Frick, lived next door on Prospect. Mildred Lucille Hoover Owen Kuhl was born in Galesburg, Kalamazoo, Michigan in 1903 and died in 1996. I'm told that she rubbed red crepe paper on the cheeks of her snow angels to give them a blush. Her son still lives in Hood River. I spy- a match box car on the necklace ... ? Is it possible that this woman, Mildred Kuhl, also had a basement that had puppets in it? Maude Peters took me to see them - I believe whoever it was made them too. It was creepy to me as a little girl of 8 or so but now I wonder who and where this was? Anyone know? I remember a lot of trees between Gramma Frick's and Mrs. Kuhl's house. And I vaguely recal some of her artwork. She and Gramma good friends and neighbors.